We all lose volume in our faces as we age or lose weight. A popular means of correction is through injectable fillers, most commonly JUVÉDERM® and Restylane®. Injectable fillers are among the most common non-surgical procedures being performed in the United States today. According to American Society for Aesthetic Plastic Surgery, over 2 million procedures were performed in 2016. The signs of aging are often associated with signs of volume loss. As we age, we lose volume in most areas of our face including the cheeks, under the eyes, around the mouth, and the lips. Modern injectable fillers use synthetically derived products that naturally occur in our bodies to restore youthful contours to our face and fill in deep wrinkles. These products are slowly absorbed by our bodies and broken down by water to naturally occurring elements of our skin. The great thing about injectable fillers are there are so many options. The worst thing about injectable fillers is that there are so many options! New products are being FDA approved every year, expanding the options that can be individually tailored to your unique needs. The most common fillers are derived from hyaluronic acid. Some fillers are made from other substances such as hydroxyapatite or Poly-L lactic acid. The family of hyaluronic acid fillers are most common and act by attracting water molecules to bind to the filler gel and increase volume. The body then slowly absorbs the filler and the volume gradually goes away. To some degree fillers are also thought to stimulate new collagen growth by your own skin to leave a lasting effect beyond the expected life of the filler. Fillers come in different consistencies and are used in different areas of the face and body based on their thickness, pliability, and rate of absorption. This makes your assessment and plan for non-invasive facial rejuvenation an individually tailored approach that takes into consideration your short and long term goals. At Restore SD Plastic Surgery we will take the time to educate you about your many options to help you look and feel your best. Injectable fillers are performed in the office by our expert staff in comfortable surroundings to restore you to a refreshed and youthful look. Injections are an art, and we have extensive experience and expertise in the finer points of fillers. The first time we see a patient for an injection procedure, we will work with you to find the ideal treatment plan and then refine your goals over time. You will have photos taken with our VECTRA® 3D imaging system and discuss treatment areas and options while viewing your photo series. This ensures you can address all areas of concern with your provider. With our state of the art Canfield software, potential results can be viewed, helping you to visualize possible outcomes. Most fillers have local anesthesia as part of their formulation, making the procedure relatively painless. We make every effort to ensure your experience is as comfortable as possible by using ice and other modalities as needed. Often blunt-tip cannulas can be used to assist in a smoother and safer application of product and minimize the potential for bruising. Fillers are injected in the office and aside from occasional bruising, there is no indication that you have had something done besides an improved facial contour. Filler injections are ideal because they have very little down time and can be done in the office. After your injection, you will have a cooling mask or ice pack to help settle down the mild discomfort that can accompany the procedure. You will be able to carry on with your usual day but are not allowed to perform any strenuous exercise or physical activity for the remainder of the day. Filler results are visible right away although there might be some increased swelling in the injected area over the next few days. You may notice some bruising around the injection sites and this subsides very quickly. Fillers complement other Facial Rejuvenation procedures to restore youth and vitality to your appearance. Fillers are often combined with neuromodulators (such as BOTOX® Cosmetic) and laser skin resurfacing. If you have been looking for a new BFF, talk to us about our multi-modal BFF approach to non-invasive facial rejuvenation – BOTOX® Cosmetic, Fillers, and Fractionated Laser treatment. Combined with an individualized skin care regimen, the BFF approach can maximize your non-invasive facial rejuvenation results. What happens at my injectable filler consultation? During your initial facial rejuvenation consultation, your Restore SD provider will perform a detailed facial and skin examination as well as review your medical history and any medications you are taking. You will have photos taken with our VECTRA® 3D imaging system and discuss treatment areas and options while viewing your photo series. This ensures you can address all areas of concern with your provider. With our state of the art Canfield software, potential results can be viewed, helping you to visualize possible outcomes. After a treatment plan is devised you will be able to receive treatment that day in the office. Our pricing for injectable fillers reflects our years of experience and precise knowledge of the anatomy necessary to provide you with a safe, reliable, and consistent experience. At Restore SD Plastic Surgery we believe in safety, training, and proper credentials for every injector. This ensures that your cost is minimized by strategic use to create a natural result. We also stand by our products, and the cost reflects the use of genuine product obtained legally. We will not sacrifice the safety of our patients by cost-cutting measures such as counterfeit filler, over-diluted filler, or product that is obtained overseas. Your comfort is our top priority at Restore SD Plastic Surgery! Rest assured that most patients report the discomfort from filler injections as being very minimal. Most formulations contain local numbing medication. Your treatment will take place in a calming environment and you will be provided with a cooling pack for the treatment areas before and after the injections to minimize any pain or bruising. Why should I choose Restore SD for my injectable filler? Getting filler injections from a provider who took a weekend course and wants to make a quick buck may seem cheaper, but you may not be getting authentic filler product and your provider may not be well versed in anatomy or able to take care of any complications. At Restore SD Plastic Surgery, we take the time to listen to your goals and partner with you to achieve the best possible results. We stand by our products and our experience. Allow us to deliver a safe, quality, and age appropriate facial rejuvenation that will leave you looking and feeling younger and more self-confident. Injectable fillers are wonderful procedures that can soften facial features and stave off some of the inevitable parts of the aging process. At Restore SD Plastic surgery, we believe in a natural approach that results in an age-appropriate appearance. We don’t endorse an overdone appearance or a completely expressionless face. As Board Certified plastic surgeons with over a decade of experience, we are intimately familiar with the precise anatomy and techniques to deliver a safe, consistent, and reliable result. I am considering filler injections for the first time – what do I need to know? 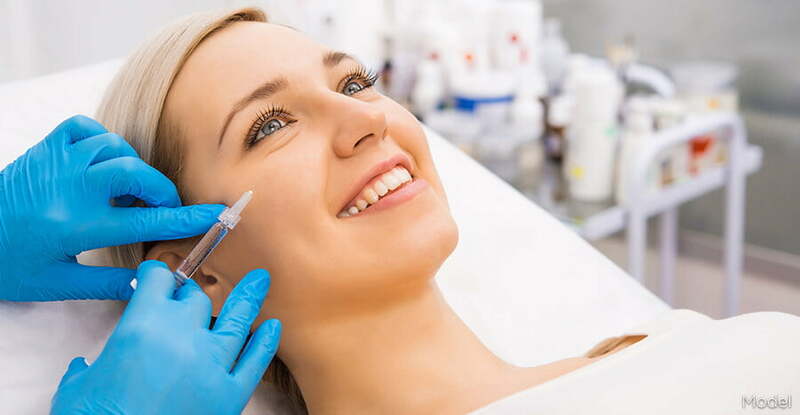 Treatment with injectable filler is a wonderful way to look and feel younger and is maximized by being combined with an individualized skin care program. If you are new to fillers, it is important to know that you will see effects right away but it can take a few days for associated swelling to subside. For our first-time patients, we recommend that you come back to the office in a week or two to assess your result and see if there are any little areas that need touching up to optimize your results. Finding the right balance of volume, frequency of treatment, and treatment areas can take a couple of visits as part of your ongoing maintenance plan. Become a member of our patient loyalty program and get the inside scoop on special offers and priority scheduling! How long do the effects of injectable fillers last? Injectable fillers can last anywhere from four to eighteen months. Some of our patients swear that either JUVÉDERM® or Restylane® works better for them. We encourage you to try both as part of your ongoing maintenance plan and see if you notice a difference. Both fillers are comparably priced so you don’t need to worry about changing products to manage cost. JUVÉDERM VOLUMA® XC is specifically designed for cheek volume restoration and the effects can last up to 18 months. Most other fillers last around 6 months. What is the difference between Juvederm, Restylane, and Belotero? All three are hyaluronic acid fillers with subtle differences in consistency and pliability. All are effective for treating areas of the face. The subtle differences make each particularly suited to an individualized treatment plan that may include one or more of these fillers to optimize your result. I had filler injection done last week and I think I need more to get my desired look? By all means, come in to the office and let us have a look. Your result and happiness are important to us and finding the right balance of volume, frequency of treatment, and treatment areas can take a couple of visits as part of your ongoing maintenance plan. We believe in erring on the side of under-treating rather than giving you and overdone and artificial appearance. Once you purchase the filler, it is yours. We can store the unused portion for a time recommended by the manufacturer for each product. Performing filler treatments is a delicate and fine art. Rather than overdoing it, we would rather have you come back after a couple of weeks for subtle touch-ups that enhance your natural look. Become a member of our patient loyalty program and get the inside scoop on special offers and priority scheduling! I had filler injections done elsewhere last week and I think it is too much and have lumps! If you are unhappy with the filler and a hyaluronic based injectable was used (Restylane®, JUVÉDERM®, BELOTERO BALANCE®) we can inject a substance that dissolves the filler. We believe in erring on the side of under-treating rather than giving you and overdone and artificial appearance to avoid this very complication. What if you don’t use all of the injectable filler at one setting? Once you have purchased the filler it is yours! We can store the unused portion in the office for the period of time allowed by the manufacturer. Coming back a few weeks later to use the rest of the product can alleviate an overdone or artificial appearance and enhance your natural look. I don’t want to get injectable filler every 6 months, is there a more permanent solution? Fat grafting utilizing fat from your own body can be a more permanent solution in some situations. Unlike fillers, there is some down time associated with this in-office procedure. After trying absorbable fillers for several sessions, you may want to discuss fat grafting as a more definitive solution for restoring volume in the cheeks, lips, hands, and under the eyes. Your Restore SD surgeon will happily talk with you to see if fat grafting may be an option.